David Spade's on-screen image is indelible: the self-centered, smart-alec brat. He's played that role with great success on the big and small screens, including in his current gig as Russell on TV's "Rules of Engagement." But off-screen, it's a different story. Spade is known for contributing both time and money to good causes, especially when disaster strikes. The 46-year-old comic actor has made large, quiet donations to Southern California fire department benefit funds, which help firefighters and their families in times of need, and to the American Red Cross last year when disastrous flooding hit Tennessee and other Southern states. Now, following the massive destruction caused by last month's record tornado outbreak across the South, Spade has made a $200,000 donation to the American Red Cross to help with disaster relief. Other stars are pitching in as well: Blake Shelton and Reba McEntire are hosting a tornado relief concert in Oklahoma, and celebrities from Michael W. Smith to Charlie Sheen have also helped. « Previous entryJennifer Lopez's 'Love? ': What's the verdict? To everyone criticizing him, it's important to realize that he didn't have to give any money at all. I am willing to bet that most of you that are bashing him haven't donated anything to the relief efforts. Spend less time hating and more time helping those who need it. Cmon Spade. Give some money you cheap JEW. The jew gold he wears in the little pouch around his neck ia worth more than that ! He is not paying his fair share of taxes. Our president will fix that ! OBAMA FOR KING ! He is a stingy jeeww. Spade is a racist fool. 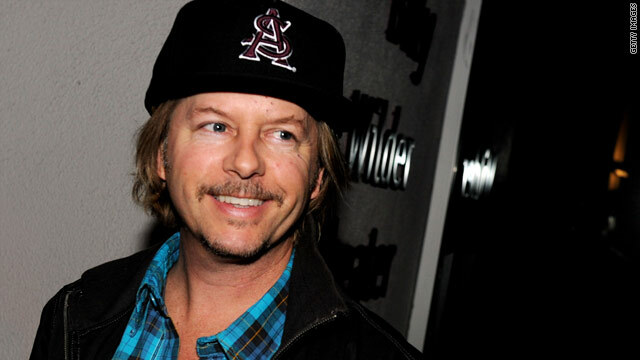 David Spade is a white druggy piece of garbage. Us African Americans dont need this @ss wipes handouts. Nice to see someone open their hearts and sincerely help out those in need. Alot of celebrities could learn something from him. Go David! both of you twisteds are mere pimples on the a$$ of humanity. We should pop you and drain your pus before you turn into carbuncles! I agreee with you twisted. He is a scuzzbag par excellente. He is just a selfish creep out to get publicity. A true jerk in the first degree. I am always amazed by his generosity , this isn't the first time he has donated where it is needed . He is a truly wonderful person . I wonder what good ol' Charlie donated? Nice to hear about people helping others! That really was genuine nice ! +10 cool points for Mr. Spade. $200K?!! Spade is worth 42million. Lets see some basic arithmetic yeilds the figure of (Drum roll please) .48% of his income. 10 cool points? Nah...I would say SHAMEFUL.